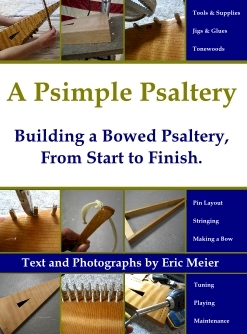 Taking care of a bowed psaltery can best be summed up in a few simple rules and common-sense guidelines. Being made primarily out of wood, bowed psalteries should be kept from the elements whenever possible. This would include rain, high heat (IE – inside a hot car), and swings in humidity. Of the most troublesome is not temperature extremes, but rather, humidity swings. Wood is hygroscopic, meaning that it will readily take in or release moisture from the air. It is this moisture change, (both gaining and losing) that is responsible for swelling and shrinking wood – even more so than temperature changes. It’s recommended that all care be taken to keep the environment where the instrument is kept as stable as possible. Try to keep the psaltery away from heat registers or windowsills, or any other area where environmental extremes may occur. One of the best possible ways to protect your instrument from outside changes is by storing it in a case. Keeping your instrument covered and in a case, or at the very least stored away – especially during severe weather – can go a long way in preventing any possible damage to the instrument. Any changes in humidity will occur much slower when the instrument is safely stored than if it had been left out in the open. As for actually cleaning the instrument, any mild household cleaners should be sufficient for the back and sides, provided they are not too aggressive. Compatibility with any given cleaner will vary depending upon which type of finish you’ve applied. For instance, since shellac is an evaporative finish that is dissolved in alcohol, using any cleaner that contains alcohol will mar the finish. Any evaporative finish can be redissolved, (and thereby damaged), by the solvent that was originally used. In contrast, a reactive finish such as polyurethane will be incredibly resilient to all sorts of chemicals and cleaners. In a reactive finish, not only does the solvent evaporate, but also after the solvent is removed, the components in the finish begin a chemical reaction changing their structure. This renders the finish durable, and unable to be redissolved in the solvent that was originally used. The only downside to reactive finishes is that they can’t be repaired or “touched up” as easily as evaporative finishes. That is, if a finish made of shellac or lacquer gets damaged, you can simply reapply the finish in a problem area, and the new finish will melt into the existing finish, becoming one amalgamated film. However, a reactive finish will remain separate from the finish’s previous film layer, and the new coats will not meld with the old. For the top of the instrument, it can be difficult to clean in between the strings with most common cleaning implements. 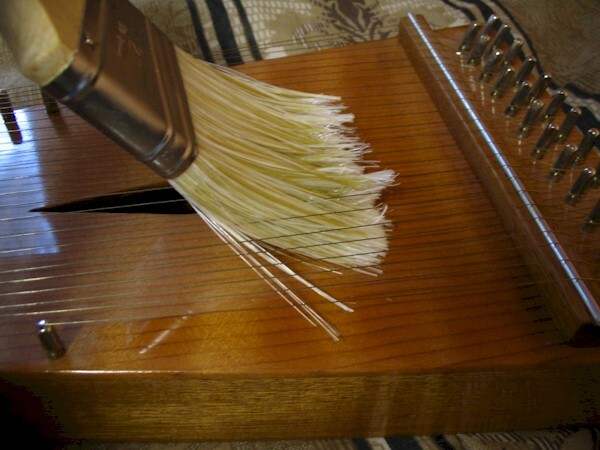 Some feather dusters can reach between the strings, but I have found a long-bristled paintbrush to be among the best tools for dusting off the top of a bowed psaltery. Try to find a brush with soft, fine, natural bristles. There are many unsuitable brushes with hard, coarse bristles that may scratch the finish. Make gentle sweeps starting from the front of the bridge up toward the soundhole. Next, move from the tip of the psaltery down towards the bridge. If you make outward motions toward the end of the psaltery, bristles of the brush may get wedged underneath the strings where they meet the hitch pins. The music wire itself shouldnt need much in the way of cleaning, but if any strings should become dirty or rusty, gently wipe the affected strings up and down with extra fine steel wool. (Designated by the numbers 000 or 0000 wool.) Sometimes this can become necessary if there is a lot of rosin buildup on the strings. If the string was rusty, you can use any rust inhibitor, (such as WD-40), after the wire has been cleaned by spraying it first into a cloth, and then gently wiping it onto the string. Take care to keep any treatment away from the area that is actually bowed. If it should happen that a string becomes bent, damaged, or rusted to the point where it cant be salvaged or cleaned, you will have to replace the string. See the section on replacing a string to remedy this.